After spending the week denying mounting evidence that their group is little more than a cynical rebranding of existing anti-homeless groups like Safe Seattle, Speak Out Seattle held their first candidate forum last night, hosting all the candidates from Seattle’s District 1 city council race. The forum was moderated by KIRO’s Mike Lewis, with questions submitted on the group’s website, and was livestreamed on Youtube, which is where I watched (most of) it this morning. 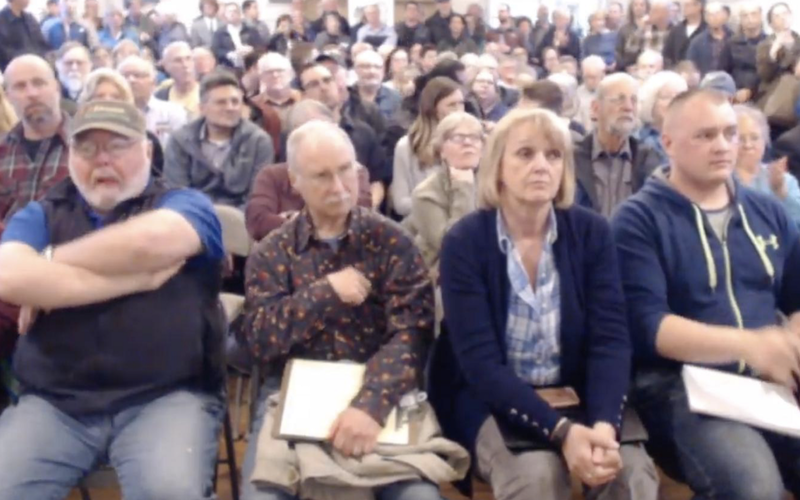 Unlike most candidate forums, it was immediately obvious that the aim here was not to get to know the wide range of candidates running for city council, but to legitimize and highlight falsehoods and urban legends that have come to define the conservative anti-homeless movement here in Seattle. This forum was not about the candidates on the stage, it was about members of the audience who had come to see their biases confirmed and put on record. The audience at last night’s forum. Seattle’s District 1 is one of the most diverse districts in the city. This was no accident. Speak Out Seattle has tailored these forums to have this effect from the beginning, and by using publicly submitted questions, they were able to choreograph the event to parrot their own talking points and shift the window of debate to avoid any comprehensive discussion of homelessness and its root cause: poverty. Poverty is the one delineating factor between every person who experiences homelessness, and while addiction and mental health issues often exacerbate, prolong, or accelerate homelessness, the only way to truly solve the problem is to eradicate poverty. Why then, in a forum set up to focus this particular issue, were people told to specifically ask only about public safety, mental health, and addiction? Is it a coincidence that these three talking points are exactly the same as those trumpeted by conservative anti-homeless groups like Safe Seattle and Unified Seattle (there is a mountain of evidence to link Speak Out Seattle to both of these other groups), and in the propaganda piece produced by Sinclair/KOMO last week? It just seems like a strange approach for a group that emphatically claims to be a non-partisan group of concerned residents focused on evidence-based solutions. Here’s the form the submit very unbiased questions. To their credit, the strategy was very effective at muddying the waters, legitimizing false claims, and presenting anecdotal evidence as fact. It allowed the host to ask why Seattle had “radically increased” business taxes while refusing to hire more police, despite the fact the city did use those new revenues to hire more cops. It gave cover to continually refer to Scott Lindsay’s recent cherry-picked report on homeless criminals as a “study”, despite it having no scientific merit whatsoever. And it gave them an opportunity to ask candidates to respond directly to KOMO’s recent anti-homeless propaganda film, “Seattle Is Dying,” despite the well-documented biases and shortcomings displayed in the broadcast. 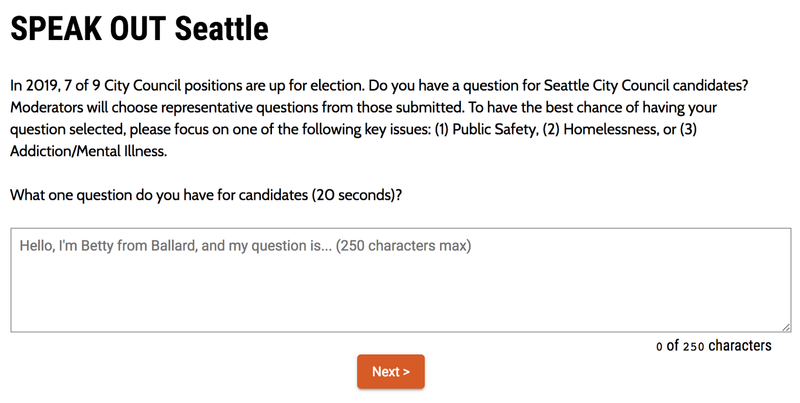 But most of all, the forum gave Speak Out Seattle a chance to legitimize themselves as worthy of being taken seriously by candidates and voters, and gives the group an early chance to shape the debate in this year’s city council elections. By accepting the group’s invitations to appear at events like this, candidates forfeit an opportunity to take a stand against the kind of misinformation that is poisoning our debate while raising the profile of a group that has proven time and again to be acting in bad faith. Going forward, serious city council candidates should decline to attend these events, and should refuse to answer questions based on dangerous conservative propaganda. If you are interested in reading more about the how last night’s forum unfolded, but can’t stomach the livestream, Erica C Barnett has a great recap over on twitter, complete with context and commentary. While you’re over there, donate to her patreon.